Photo: James Ransom/Courtesy of Food52. Food52 helps people become better, smarter, happier cooks. Food52 was named 2012 Publication of the Year by the James Beard Foundation and won Best Culinary Website at the 2013 IACP awards. Here at Food52, we love recipes — but do we always use them? Of course not. Because once you realize you don't always need a recipe, you'll make your favorite dishes a lot more often. Today: Kale is in every kitchen and on every menu these days. The other day, a friend of mine declared that she’s "over" kale salad. I get it. I really do. Kale salad is everywhere: online, in restaurants, in juice bars. I even spotted some at an airport recently. But, please, don’t be put off by the trend. 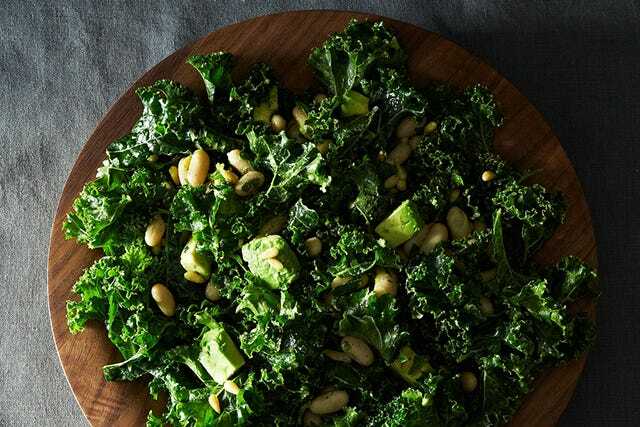 Kale salad has gotten popular because it is simply that good. Yeah, it’s healthy as heck, but it’s also versatile and delicious. It’s hearty, and it holds up to denser fillings than your average bowl of frisee or mesclun. And, unlike most salad, the next day leftovers are even better than the original batch. Like all salads, kale salad is easy to make without a recipe, using your favorite salad mix-ins as you go. My kale salads often serve as an entire meal, which means that I pile them high with robust fillings: beans, sweet potatoes, nuts, and seeds. I also love throwing in some torn herbs and/or lemon zest for extra flavor at the end. Recently, my friends at Food52 inspired me to try breadcrumbs on my salads: added crunch, but less commitment than croutons. What you should know before you start is that it’s going to wilt down significantly, right in front of your eyes as you "massage" the dressing into the kale. 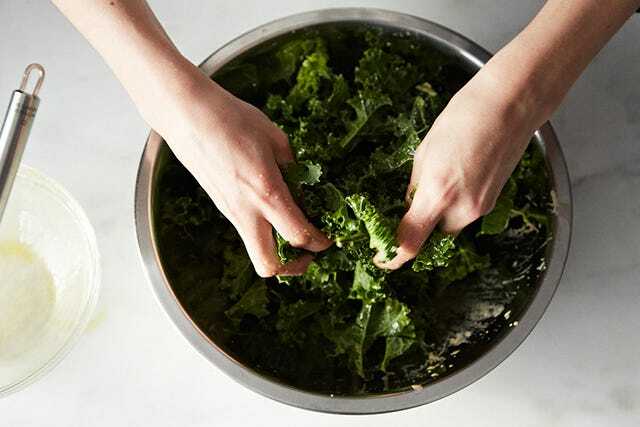 So, if you’ve just washed, chopped, and dried your curly kale, and it seems as though you’ve got a mountain of green leafy vegetable on your hands, take heart. It’s going to be okay. As soon as you dress the kale, you’ll be dealing with reasonable portion sizes. I routinely polish off what looks like a giant bowl of kale in two servings. Or even one. 1. 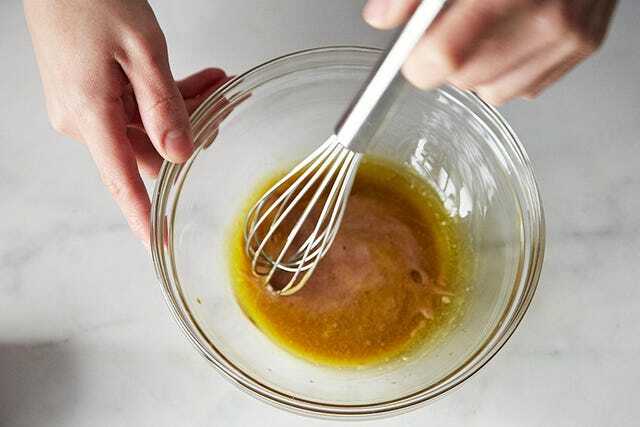 Whisk together your vinaigrette. I like to use a simple 2:1 olive oil to lemon dressing, with some dijon mustard and maple syrup added for extra flavor. Apple cider vinegar and flax oil, whisked together with dijon mustard and nutritional yeast, is another favorite. Sometimes I add curry powder or turmeric to my vinaigrette for an added kick. If you like, you can use only a small amount of olive oil, and then use some acid (vinegar or lemon) and avocado as your dressing instead. 2. Add your dressing to the salad. You may want to start with a small amount, incorporate it, and then add more as needed. 3. Massage your dressing into the salad. Get your hands dirty! The more you rub dressing into the greens, the softer and more palatable they’ll become. Some bunches of kale are more tender than others. If you have a very tender bunch, you won’t need to spend as much time on dressing. Click through to Food52 for the final steps — the add-ons!